"Ball 'N' Chain" redirects here. It is not to be confused with Ball & Chain. A Spinner, originally known as Ball 'N' Chain (also spelled Ball 'N Chain or Ball and Chain), is a spiked ball on a chain first appearing in Super Mario World. They are usually found in castles and similar environments, and are often indestructible. Their behavior varies depending on the game, switching between spinning around in a circular motion and swinging repetitively in a pendulum motion. The chain also changes, with most games allowing Mario to safely pass through it unharmed. Ball 'N' Chains first appear in Super Mario World, in castles and fortresses. They continuously rotate from a Gray Block. Using a Spin Jump will allow Mario/Luigi to harmlessly bounce off the spiked ball. The only way this obstacle can be defeated is by using a Super Star, but its sprite will change into a defeated Bony Beetle, as it was never intended to be destroyed. Rotation-style Ball 'N' Chains reappear in New Super Mario Bros. These obstacles are very rare, with their only appearance in World 7- . The blocks are still there, and one even has a Star Coin. Aesthetically, they spin wildly on the end of the chain as well as rotating on the block; however, this does not affect their attack. Rotation-style Ball 'N' Chains reappear in New Super Mario Bros. Wii once, in World 3- and in a secret area of World 4- . 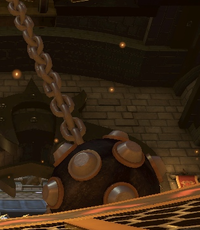 In Super Mario 3D Land, Ball 'N' Chains (known here as Swing Spikes) appear in purple with yellow spikes and chain. Like some earlier appearances, they are not linked to shackles. Instead of performing complete rotations, they only make pendulum movements. They can be destroyed by making contact with them as Statue Mario. The first level they appear in is World 1-2. In New Super Mario Bros. U, they appear under the current name Spinner, which is a retranslation of the original Japanese name. Regular and giant versions appear, once again swinging in a pendulum-like manner. These Spinners cannot be avoided by passing through the chains, as they have been spiked like the iteration from the Yoshi's Island series. Mario can pass through Spinners while under the effects of a Super Star, though he cannot destroy them. A Ball 'N' Chain makes a brief appearance in the Super Mario World animated series episode "Send in the Clown". Mario, while traveling through Neon Castle, narrowly avoids being hit by a Ball 'N' Chain that drops from the ceiling as he traverses over some lava. Rotation-style Ball 'N' Chains appear in Super Mario World 2: Yoshi's Island. They are colored orange instead of black, and usually found in forts. Their chains are replaced by spiked bars, some of which are double-sided. Hacking shows that they can by destroyed by Superstar Mario. A variation called Tekkyū Dosun have spikeless chains and are operated by certain Boo Guys. Ball 'N' Chains appear in Yoshi's Story, where they swing in a manner similar to pendulums for the first time. Unlike Super Mario World 2: Yoshi's Island, their chains are harmless. They are found alongside Tekkyū Dosun-like iron balls, which share the same graphics. Both appear in the stages The Tall Tower and Magma Castle. Ball 'N' Chains reappear in Yoshi's Island DS. They act they do in Super Mario World 2: Yoshi's Island. Spinners reappear in Yoshi's New Island. Their behavior remains unchanged. Spinners also appear in Yoshi's Woolly World and Poochy & Yoshi's Woolly World. This time, they are colored black instead of red. Their behavior remains unchanged. 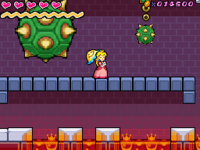 In Super Princess Peach, pendulum-style Ball 'N' Chains appear in Bowser's Villa, where they swing back and forth between the background and foreground. 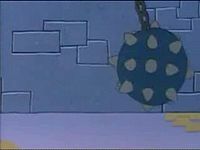 The chains resemble their appearance in Super Mario World, but the spiked balls are green, having a resemblance to Bowser's Shell. Motionless Ball 'N' Chains make a minor reappearance in Mario & Luigi: Partners in Time, where they are seen hanging from the ceiling as decorations in Bowser's Castle. In Mario Kart 8 and Mario Kart 8 Deluxe, a single Spinner appears as an obstacle in Bowser's Castle. The obstacle acts virtually the same as the pendulums in Tick-Tock Clock, except that the player will spin out upon hitting it. The Spinner will move faster during the final lap of the race. Pendulum-style Spinners appear in Mario Party 10 in the minigame Spiked Ball Scramble, where they hang from the ceiling and swing across the path. They can be encountered in a standard and a larger size, and take out players in one hit. Furiko no Tekkyū From guruguru, a Japanese onomatopoeia of spinning round and round. Spinner Bar (Yoshi series); a possible reference to Guruguru Bar. ↑ Stratton, Steve (November 18, 2012). New Super Mario Bros. U: Prima Official Game Guide, page 129. ↑ Nintendo Mario Mania Player's Guide. Page 52. ↑ Nintendo Mario Mania Player's Guide. Pages 75, 90, 100, 144. ↑ Shogakukan. 2015. Super Mario Bros. Hyakka: Nintendo Kōshiki Guidebook, pages 60, 118, 150, 215. ↑ 「スーパーマリオアドバンス3任天堂公式ガイドブック」 (Super Mario Advance 3 Nintendo Kōshiki Guidebook), page 196. This page was last edited on April 18, 2019, at 12:33.